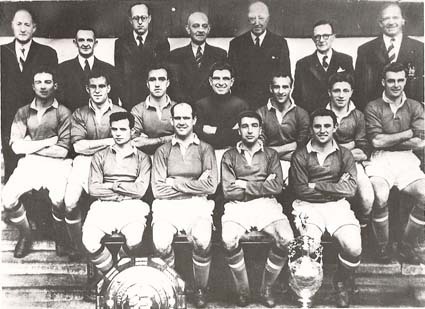 Back row: T Curry (trainer), W Crickmer (Secretary), J A Gibson, Dr W McLean, G E Whittaker, W H Petherbridge (Directors) and M Busby (Manager). Middle row: J Downie, J Rowley, J Aston, R Allen, A Chilton, R Byrne, S Pearson. Front row: J Berry, J Carey, H Cockburn and T McNulty.